It’s amazing. How could I have forgotten to put up a post about this musical? 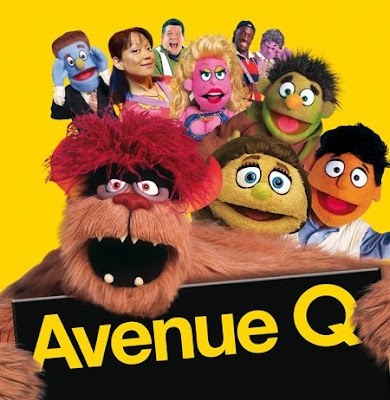 Avenue Q. An x-rated sesame street/Muppet Broadway musical had be gasping for air in between laughter! I swear I haven’t laughed this much since Spamalot. It was funny and adapted for the Aussie audience but it was still hilarious. I still can’t believe that you could do that and THAT to puppets!! Oh my!! Go watch it if you need a good laugh!! Story revolves around this character “Princeton” a fresh eyed graduate with a BA in English finding his way in the world. He moves to Avenue Q and meets a bunch of characters there and together they sing, dance and swear their way to each other’s hearts…. The Boy said that it was an “Ok” musical.. and that he preferred Spamalot. However, I did hear him laughing a lot as well. He’s also got a little crush on the lead female (Michala Banas)so he was a bit bias when it came to her. But it is a totally different type of musical, with puppets. Tickets weren’t that expensive if I recall, around the $80 mark. And we were seated right in the middle of the stalls in Row B. So I was stoked. I did buy the tickets exactly a year ago on recommendations from people who have watched it at the West End.